Poached in spiced cider and white wine, this beautiful pear crumble is an absolute easy and satisfying winter dessert! Have you guys tried poaching pears before? This was my first attempt and I am not sure why it took me so long. Poaching a pear is simple and they are the closest thing to bliss as I have come across recently! What’s poaching? It is gently simmering fruit in liquid. 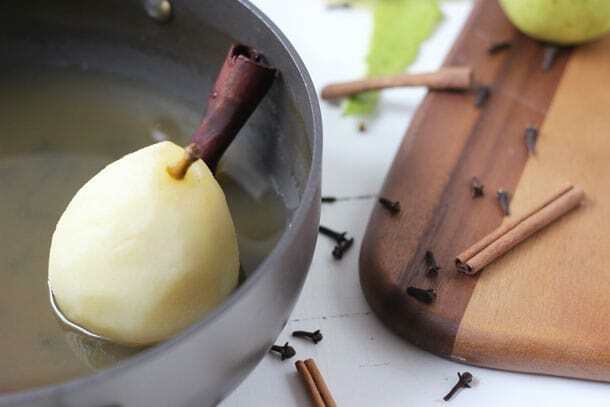 The traditional liquid for poaching pears is wine and sugar mixture, but you can get creative with your flavors and spices of your liquid like I did here with apple cider and white wine. There is just something about the soft fragrance of poached pears that makes me swoon at the simplicity and delicacy of this lovely fruit. This spiced poached pear crumble starts with poaching ripe but firm Anjou pears in a spiced cider liquid with white wine. 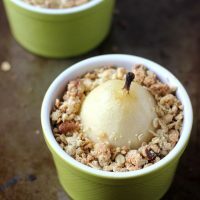 The poached pears are then baked on top of an oat-nut crumble to give you a crunchy, sweet dessert. 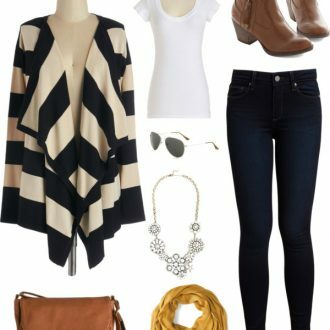 It just screams winter and a scoop of ice cream will be perfect with this. 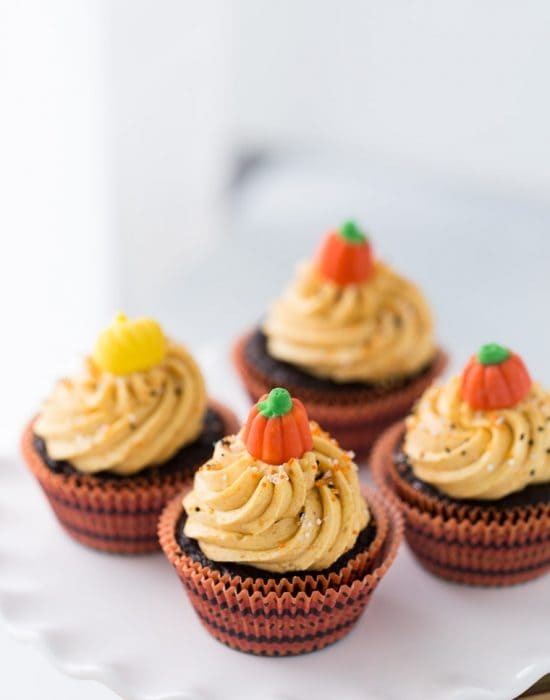 Don’t let all the pumpkin and apples keep you away from one of fall’s delicious finds. Pears are at their peak right now and all 10 varieties are being harvested so grab a few soon and start enjoying them. Don’t forget poaching is also a great way to keep pears around a little longer. You bet, I’ll be keeping a few cups of diced poached pears refrigerated to top on my morning yogurt and granola or as Mr J said, as ice cream topping. Want to get creative with your poaching liquid? Try experimenting with tea, bourbon, coconut milk (oooo!!) or coffee. The list if endless. Place the pears, cinnamon sticks, cloves, cider, wine and enough water to cover them in a medium saucepan set over medium high heat. Bring to a boil and then reduce heat to simmer. Cook pears on simmer until just soft, about 20 minutes. Poke with a toothpick to check doneness. 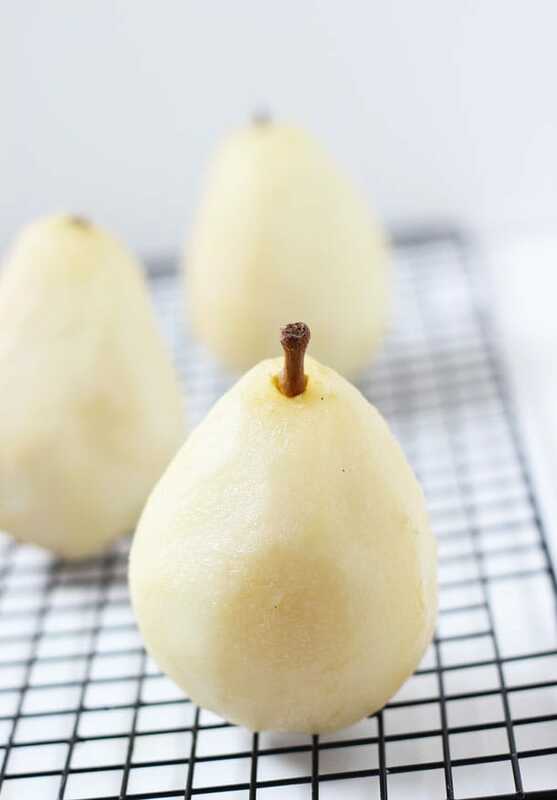 Using a slotted spoon, remove pears from the water and let cool on a cooling rack. Preheat oven to 400 degrees F. In a medium bowl, whisk together oats, flour, brown sugar and walnuts. Using your fingers, mix in the butter into the mixture until it looks like breadcrumbs. 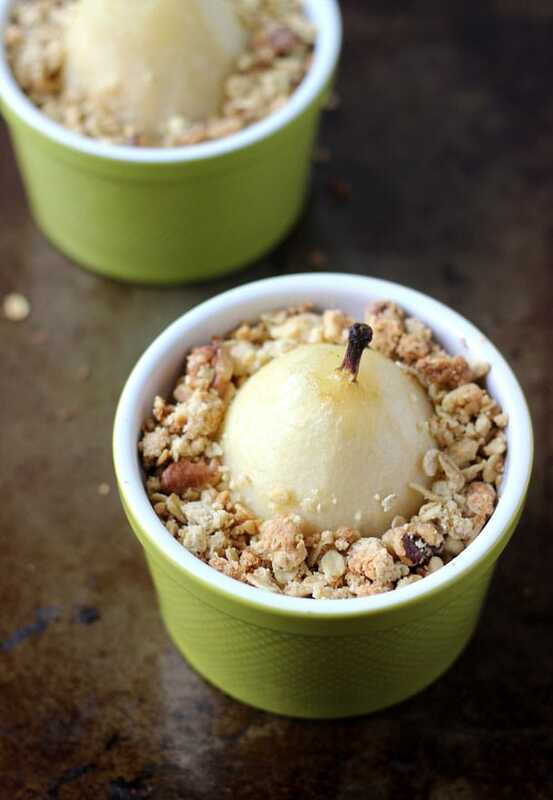 Place each poached pear into a ramekin and fill ramekins all the way to the top with the crumble. Press down gently. Bake until crumble is lightly brown, about 30 minutes. 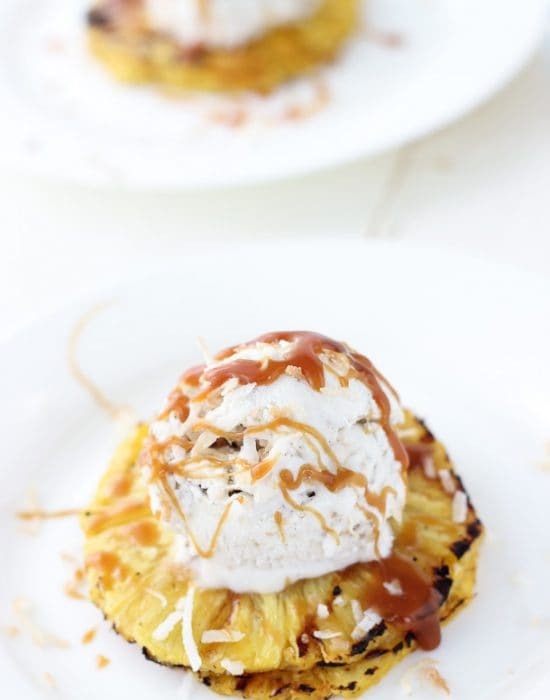 Serve warm with ice cream. This looks sensational! I’ve wanted to try poaching pears for dessert but have yet to. I love these pretty pears nestled in that delicious crumble. Great dessert! You need to try them soon. They are so easy Monica! I just love poached pears, they’re so simple and versatile and yet they look so elegant. I’m loving yours with the wine and cider, and they look adorable peeking out the top of that cute bowl! They really are!! Thanks dear!! I love spiced poached pears. This is such a delicious flavor combination and I am definitely going to be trying it. The pears look sooo good nestled with that crumble. Yum! ooooh I’ve been meaning to try poaching pears! I just did a pear recipe this week, and I’m craving more pear stuff! Those look and sound amazingly delicious Zainab! I suppose I should learn how to poach pears next. 😉 Yum!! Uhmmm? There is no learning! Pot + pear + liquid!! Donzo! Just made my first ever batch of poached pears this morning too! Oh my goodness, it was all I could do to keep myself from eating them straight out of the pot. I bet these smelled so good! I am in awe of your creativity right now, using the whole pear + crumble is just genius. Gorgeous photos too! Right?? They are so freaking delicious and smell great!! I saw you had orange zest?? I can’t wait for your recipe!! I love poached pears, and serving as a crumble is a great idea! OMG, I LOVE LOVE LOVE poached pears! I never thought to make a crumble out of it! I’m loving this idea of poaching in bourbon too! Pinned! I love your excitement for pears!! Ooh Zainab! I’ve never poached a pear (for some reason) but I definitely need to now! 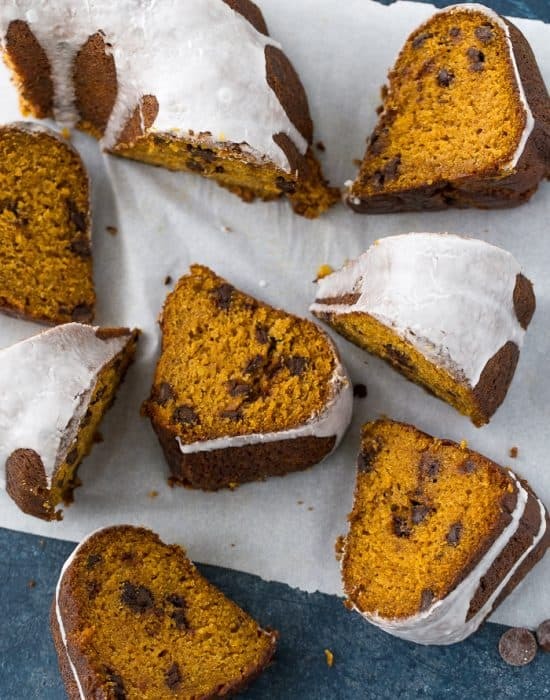 What a perfect fall dessert. Yes you need to now!! This is such a great idea, Zainab! I love the flavors you infused with the poached pears and it sounds ah-mazing served with the crumble! So simple, elegant and gorgeous! These look delicious Zainab! I love that you made a crumble out of them too! Oh my goodness, this looks amazing!! I have actually never made any kind of crumble before, but I will before fall is over! 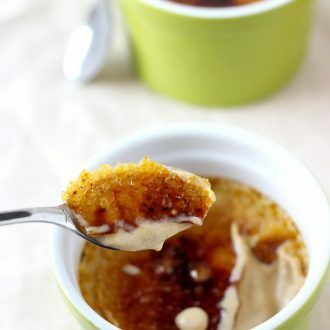 You need to get a buttery crumble going!! They are the best. 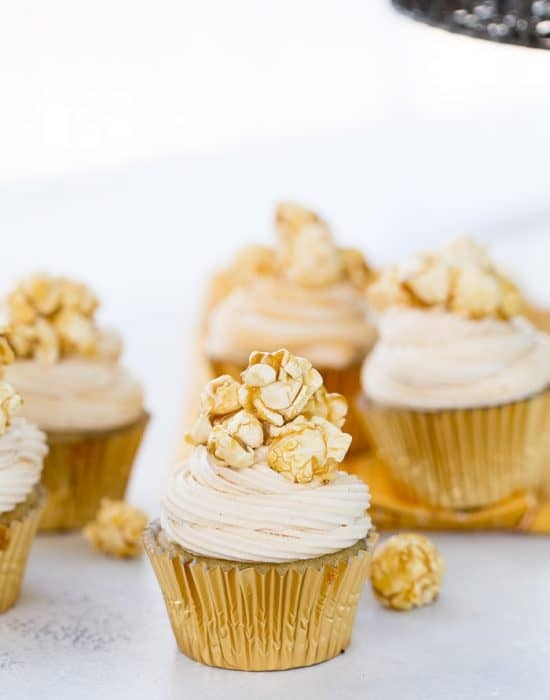 This looks divine, Zainab! Love the spices! These pears are just gorgeous, Zainab! 🙂 And I love the crumble with this. Oh yum, there is something so wonderfully mellow and comforting about pears. What a lovely dessert! What a beautiful dessert, love poached pears! This is seriously one of the gorgeous most sophisticated desserts around. Beautiful and pinned. Dude, I LOVE poached pears. . and pairing this with the crumble is genius. . and elegant .. LOVE this!! This is gorgeous! 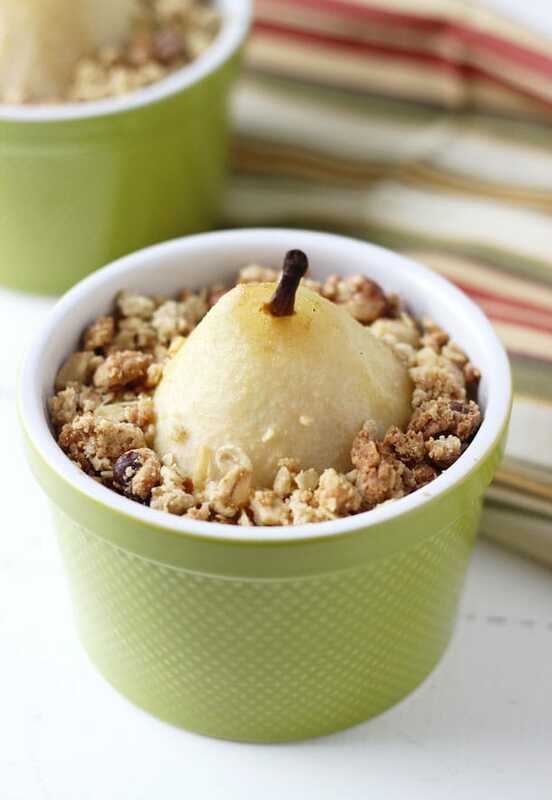 I love that the cute little pear is nestled under the yummy crumble… poaching pears is so easy!! Thanks Jess!! And yes it’s so easy!